Have you ever wanted to add a music system into your boat but wondered which type or brand to buy? Maybe you went looking for a marine stereo and the multiple choices available on the market today got you feeling spoilt for choice. Well, worry no more for we’ve got you covered. We’ve analyzed and reviewed the best marine stereo systems in the market and included a guide on what to look out for when buying a marine stereo. By going through this review and buying guide, you’ll surely stand a chance of investing in a reliable stereo system. By investing in a good stereo system for your marine vessel, you’ll revolutionize your overall experience and time spent out in the waters. Whether you want to create an atmosphere for boat parties or just unwinding while fishing or taking part in water sports, adding a stereo system will surely make your boating time more enjoyable. The wide range of marine rated stereo systems available today makes it quite challenging when choosing the best option to buy. If you’re not informed, you might end up investing in a product that’s not ideal for your marine vessel. However, with thorough research, you can surely make a better choice. That’s why we’ve done a thorough research on the top marine stereo systems and narrowed down to the best 5 options. We gathered recent reports from experts on stereo systems to guide us on the features that a stereo system for the marine environment must have. In addition, we analyzed experiences from real users on the brands and types they found as most reliable for their marine vessels. They gave us details on what they found great as well as shortcomings of the stereo systems they have ever used. 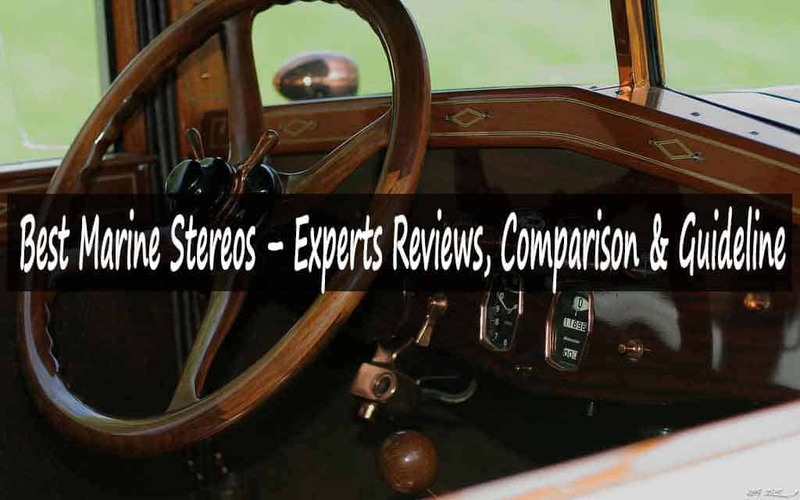 Upon gathering this information, we’ve been able to review the best 5 marine stereo. With this review, you’ll surely find a great option for your boat. The NOAM NUTV4 stereo system stands out for its unique Bluetooth remote control. Its remote control is more than a wireless control. You can control your paired device using the remote while streaming music to the stereo. Additionally, you can hookup a 3.55 mm to AUX cable from your phone into the AUX input on the remote control. Backlit remote controls: The remote control that comes with this stereo system stands out for its backlit feature. You’ll able to use the controls even at night since their backlit nature makes the controls more visible in the dark. Two-way speakers: The NOAM NUTV4 stereo comes with 2-way speakers for a more enhanced music experience. The 2-way speakers add more sound to your boat and are mountable such that you can hang them anywhere around your marine vessel. Water resistant system: This stereo boasts of having speakers, amplifier and remote control that are all water resistant. Their water resistant nature makes them ideal for use in the humid and wet sea environment. Four channel amplifier: Another notable feature that comes with the NOAM NUTV4 is that it comes with a four channel amp. This means that you can be able to add more speakers and even a subwoofer to the stereo for enhanced music experience. AUX input: The remote control of this stereo comes with an AUX input. The input makes it easy to connect any music player using a 3.5mm to AUX cable, especially for music devices that don’t come with Bluetooth support. Our Verdict: The NOAM NUTV4 has everything you would need in a marine speaker, especially for boat lovers who prefer connecting mobile music devices via Bluetooth to the boat stereo. However, it’s a bit challenging to mount the speakers in some boats. Nevertheless, it’s pricing is great for its features, thus check it out on Amazon. BOSS Audio MGR350B is a combination of a music player and AM/FM radio tuner with support for Bluetooth music streaming. This makes it a great stereo for any boat owner who would want to enjoy boating while listening to their favorite radio station or music. Switchable AM/FM tuner: The stereo comes with a radio AM/FM tuner whose frequencies are switchable between different geographical zones. You can easily choose between frequencies designed for both the United States and European regions. Inbuilt equalizer: You’ll truly appreciate the fact that this stereo system features an inbuilt equalizer to control different effects. You can easily use the equalizer to control or balance sound effects such bass, fade and treble among other such effects. RDS tuner: The stereo comes with an RDS tuner that displays radio stations on its display. This way, you’re able to know the identity of radio stations that you’re tuning in form of text on the display. USB port: Another great feature that comes with the BOSS Audio MGR350B is its USB port. The USB port allows for streaming music from USB devices such as flash disks or a memory card hooked in a USB adapter. Ultraviolet coating: The front panel of the stereo is UV coated. UV coating is a curing technique that protects the interior system from harmful radiation rays. Our Verdict: If you’re looking for a really affordable, yet fully functional stereo, then consider the BOSS Audio MGR350B. You’ll surely need to buy separate amplifier and speakers, but it has all the key features you would need in a stereo system. Kenwood is known for its great music systems. For instance, the Kenwood Marine is one of a kind stereo for it features everything you would really want in a boat stereo. Its multifunctional support, inclauding support for CDs, dual phone connection and fast USB charging, makes it stand out among its competitors. Waterproof speakers: All the four speakers that come with the Kenwood Marine are waterproof. They’re designed to prevent water from entering into the sensitive speaker components such as the coil that can get damaged from exposure to water. Corrosion proof speaker material: The construction material enclosing the speaker components is made of a corrosion free material. This material is perfect for the highly corrosive sea environment that comprises of saltiness and humidity. Radio antenna: It’s worth noting that this stereo comes with an easy to hook antenna. The wired antenna makes it easier for the stereo to receive radio frequencies in the harsh sea environment. CD player: In addition, this stereo for boats comes with an in-dash CD player. You can easily play your CD music in the stereo and view details about the current track on the front display. Marine rated speaker cable: The stereo comes with marine rated speaker cable for connecting the stereo to the four speakers. The 50 FT speaker cable makes it easy to set up speakers widely apart and its marine rating means that it’s not susceptible to harsh sea and weather elements. Our Verdict: Boat owners who want to upgrade their older stereo systems or first time stereo buyers would truly find this multifunctional Kenwood Marine as a great choice. Its four powerful speakers speak for themselves and there’s absolutely no reason why you shouldn’t check it out. Tired of searching for a small size marine-rated stereo? Look no further. The Clarion CMS2 is one of the best marine stereo. It stands out from other stereo systems due to its slim, small size and compact design. It can fit on any boat space, thus you’ll not be limited to use it regardless of how little your boat space might be. Three-Line LCD display: The stereo features a three-line LCD display. The three lines of display allows for display of more information in form of text. Six channel outputs: A great feature about the Clarion CMS2 is its six channel RCA outputs. The multi-channel outputs means that you can connect multiple speakers, or even an amp for more power. Global radio tuner: This boat stereo boasts of having a global radio tuner that supports AM and FM radio frequencies. It can easily capture any FM or AM frequencies regardless of your geographical region. Slim, compact design: You’ll truly adore the stereo for its slim and compact design. You can easily mount it on any space and its slim design makes the sides less visible, revealing just the stunning front panel and controls. Watertight display and controls: The display panel and controls boast of a watertight design. You can use this stereo without worries of humidity seeping into the display or controls. Our Verdict: Anyone with limited boat space would surely appreciate the compact, small size design of the Clarion CMS2. Although you’ll pay more for this stereo, you’ll surely enjoy the great features that come with it. Thus, consider it in your shortlist. The Fusion Entertainment MS-RA70 stereo is yet another great and unique marine grade stereo. It comes with a 4 channel, 50 watts amplifier. Thus, you’ll not have to use a separate amp with this stereo. You can simply hookup speakers or a subwoofer to its amp outputs for enhanced sound experience. Optically bonded display: The stereo features an optically bonded display. This display is extremely clear and protected from the harsh sea environment. Supports Android, IPhone and iPod: The tuner comes with full support for Android and iPhone devices. You can connect these devices via USB or pair them wirelessly through Bluetooth. Standard rear design: The stereo has a standard rear design that is well built for the marine environment. The rear din can easily fit into any standard hole cut on the dashboard. Inbuilt Class-A Amplifier: Another great feature that comes with the Fusion Entertainment MS-RA70 is its inbuilt Class A amp. This type of amplifier is simple in design, yet it resists crossover distortion for better sound output. An easy to use interface: The interface that comes on the front panel features easy to use controls. Even a first-time user would easily understand and control the stereo without struggling with the buttons. Different stereo systems ideal for the marine environment come with different features. However, some features are a must have. The last thing you would want is investing in a stereo that cannot survive in the harsh sea environment. With that said, what features should you look for? Read on through this article for the things to consider before buying a marine stereo. You’ll be using the stereo in an environment full of water and humidity. Rainstorms are also common out in the seas. Thus, you’ll not want to invest in a stereo that can easily allow water into the electronic components. You should rather invest in a stereo that is waterproof for use in your boat. If the stereo comes with speakers, they should also be waterproof. The casing, control buttons and front panel should be designed to be waterproof such that they don’t allow humidity or water into the internal components. The sea environment is basically open. Even if your dashboard is protected from direct sunlight, some harmful UV rays may still find their way on the dashboard and they may be harmful to your stereo. Thus, consider investing in a stereo whose LCD display and front panel are specially treated for protection against harmful UV rays. The best marine stereo should come with some of the most useful features. For instance, it should at least support Bluetooth technology. Today, Bluetooth technology is very useful when it comes to music streaming. A stereo with Bluetooth support will allow you to stream music from your smartphone, tablet or even laptop. Also, a stereo with a USB port for streaming music from flash disks and charging mobile devices such as your smartphone would be a plus. It should support playing music in different formats. If the stereo has an inbuilt amplifier, it’ll also be great. You may also consider a stereo with a CD player, but CDs are somehow becoming outdated. Of course, you wouldn’t want to struggle with a stereo that’s too challenging to install. The ideal option is a stereo that’s easy to mount and install. It should also come with an installation kit and appropriate cables for connecting power and speakers. An ideal marine stereo should come with a radio tuner. Besides listening to music via Bluetooth, CD or USB, you would also want to catch some breaking news from your favorite radio station. A stereo with a radio tuner should also come with a marine rated antenna to receive radio frequencies easily in the harsh sea environment. Ensure the stereo comes with all the necessary controls. It should at least come with controls for power on/off, playing/pausing tracks, skipping tracks and/or radio stations. In case it has an inbuilt amp, it should have controls for balancing bass, fade, treble and other such controls. It’ll be a plus if the stereo comes with a remote control. Also, ensure the stereo has an LCD display for displaying information about the current track and name of the radio station. Finally but not least, you wouldn’t want to be stuck with a stereo that does not allow you to add extras. For instance, the best stereo should come with outputs for adding extra speakers and amplifier. It should also have the most necessary inputs such as RCA. In conclusion, it’s obvious that different marine grade stereo systems come their own unique features. Each of the stereo systems reviewed here has some unique features that makes it outstanding from the rest. Similarly, these 5 options listed here also come with some minor shortcomings. Overall, you should go for the stereo that has all the features you want. As long its shortcomings are minor and manageable, you’ll be good to go.Only choose a stereo based on the features it has and not just the price. If you only consider the price, you might end up with a low quality product that will demand replacement sooner. You should try to balance between the price and features without overpaying. From this review, you’ll surely find the best marine stereo ideal for your boat. With this review and guide, you’ll rest assured of investing in a marine stereo that won’t disappoint.